This is a powerful sudoku game. 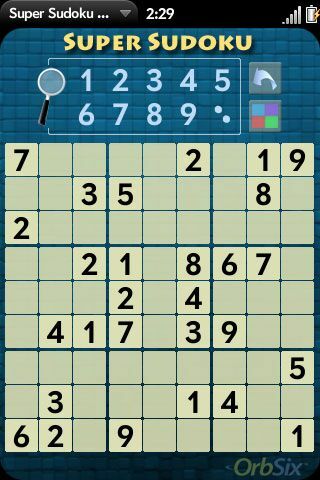 If you love sudoku, but you can't find satisfaction with the other options available on the Pre, this game is for you. 5 different puzzle difficulties, from easy to insane! Made the candidate marking much more intuitive. If you don't have automatic candidates turned on, you can still mark and remove them manually. Made an option to have the pencil mode "Sticky" so it stays on. This is now turned on by default. But if you like it the other way, you can turn it off. Now the highlight filters always highlight both the numbers and the candidates, although in different colors so you can see the difference. Option for translucent number box, to be able to see the numbers under it.